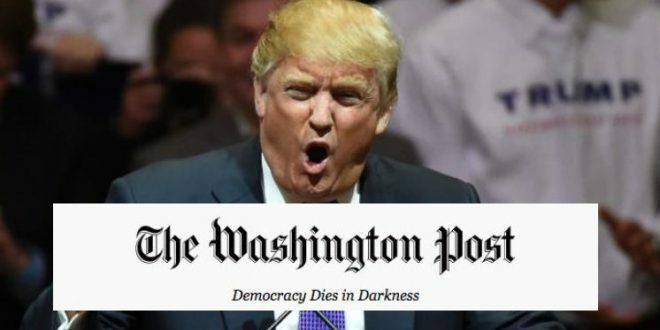 WaPo's New Tagline: Democracy Dies In Darkness - Joe.My.God. On a list of President Trump’s friends, the mainstream media is not likely to be found — and that may be putting it lightly. From the days of his campaign to what are now his days in office, the president has criticized long-respected news outlets and their journalists for putting out what he calls “fake news.” However, the battle isn’t totally one-sided, as The Washington Post’s new slogan about democracy seems to take a clear stand on the matter. “Democracy dies in darkness.” That’s the refrain atop the Post’s online homepage, Snapchat stories, and elsewhere. The slogan reportedly popped up last week, beginning with Snapchat. According to CNN, a spokeswoman for the paper, Kris Coratti, said readers should expect to see more of it moving forward. After more than 200 years with the First Amendment on the books, you’d think the United States would have this whole “freedom of the press” thing down. Yet President Trump seems determined to undermine the work of the major media outlets that report on his administration. In the wake of Trump’s “fake news” attacks, it’s enlightening to see the Post’s subtle-yet-important new slogan. Without the media to shed light on the activities of the administration, the American democracy is sure to dim.